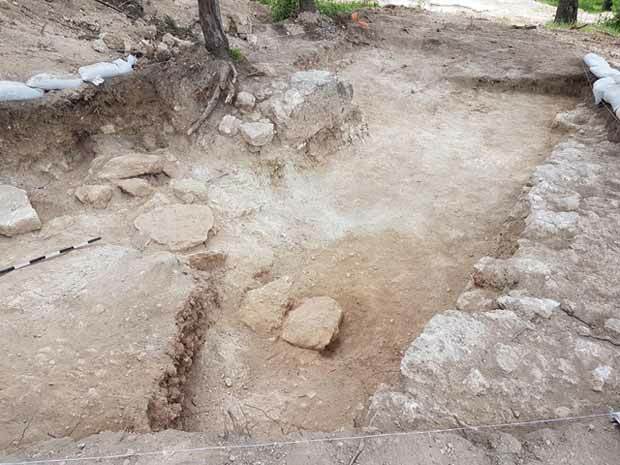 In March 2017, a trial excavation was conducted at Kibbutz Megiddo (Permit No. A-7927; map ref. 217329–574/720400–561; Fig. 1), prior to construction in the southeastern part of the kibbutz. The excavation, undertaken on behalf of the Israel Antiquities Authority and financed by the Kibbutz Megiddo, was directed by N. Feig (field photography), with the assistance of Y. Yaʽaqobi (administration), R. Liran (surveying and drafting), H. Tahan-Rosen (pottery drawing), youth from Ramat Hadassah and laborers from Nazareth. The site, bordering the southern slope of Tel Megiddo, was excavated in 1908, when remains ranging in date from the Roman to the Early Islamic periods (second–eighth centuries CE; Schumacher 1908:182–186) were unearthed. 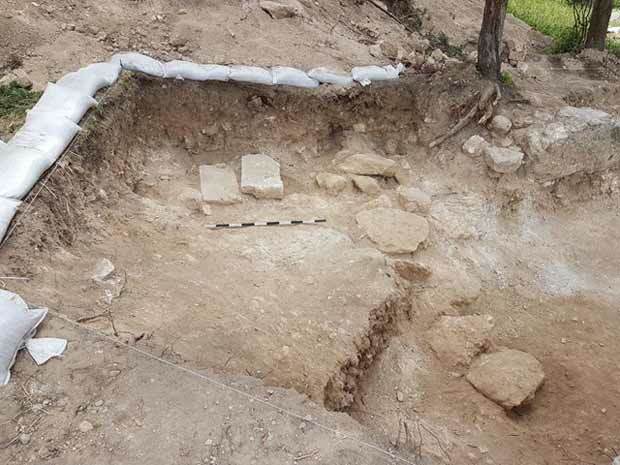 In recent years, quarries, winepresses and tombs (Gur and Abu-‘Uqsa 2012), as well as building remains from the Byzantine–Early Islamic, Crusader and Mamluk periods (Tepper 2013a) were excavated within the precincts of the kibbutz. 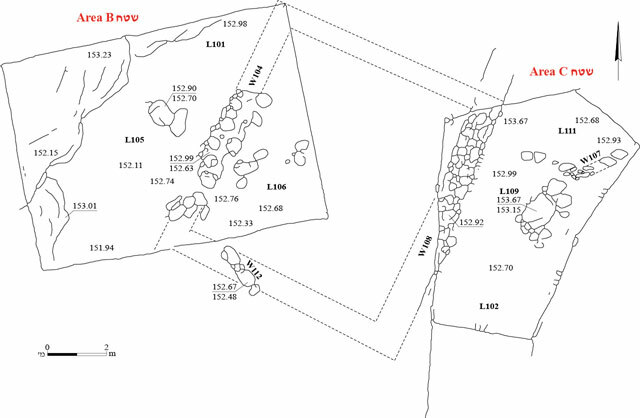 Surveys performed at the site in 2004 yielded building remains, rock-hewn installations and architectural elements dating mostly from the Roman, Byzantine and Early Islamic periods (Tepper 2013b), as well as wall remains and concentrations of pottery sherd ranging in date from the Bronze Age to the Hellenistic period. 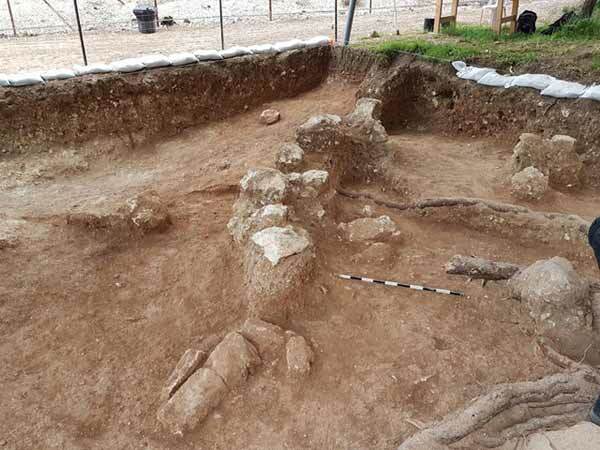 The excavation was conducted in a densely forested area, where tree roots damaged the antiquities. About 5 m east of the excavation was a defensive trench that was dug on the eve of the Six Day War; the earth removed from it was dispersed throughout the area. 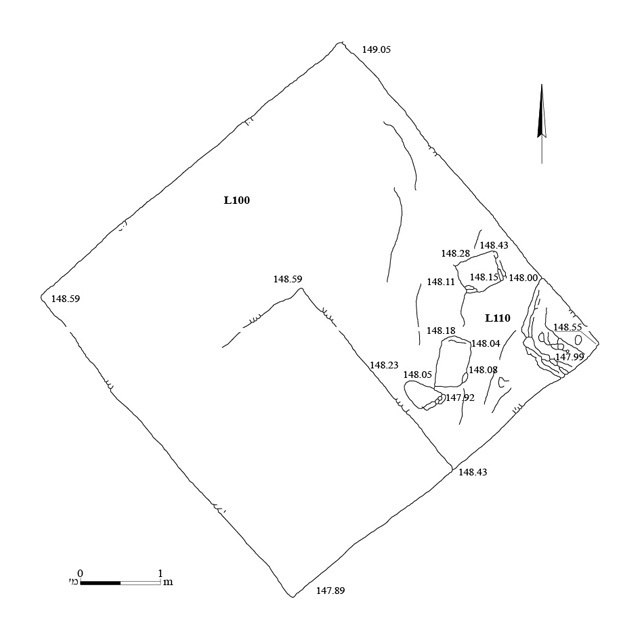 Six squares were opened in four adjacent excavation areas (A–D; Fig. 2), yielding Hellenistic pottery sherds, building remains from the Roman period and a concentration of Byzantine-period potsherd. Area A (Figs. 3, 4). The topsoil (thickness 1.2–1.3 m), excavated by means of mechanical equipment, contained a concentration of mixed pottery sherds, including Roman-period cooking pots and an amphora base from the Hellenistic period (L100; see Fig. 10). 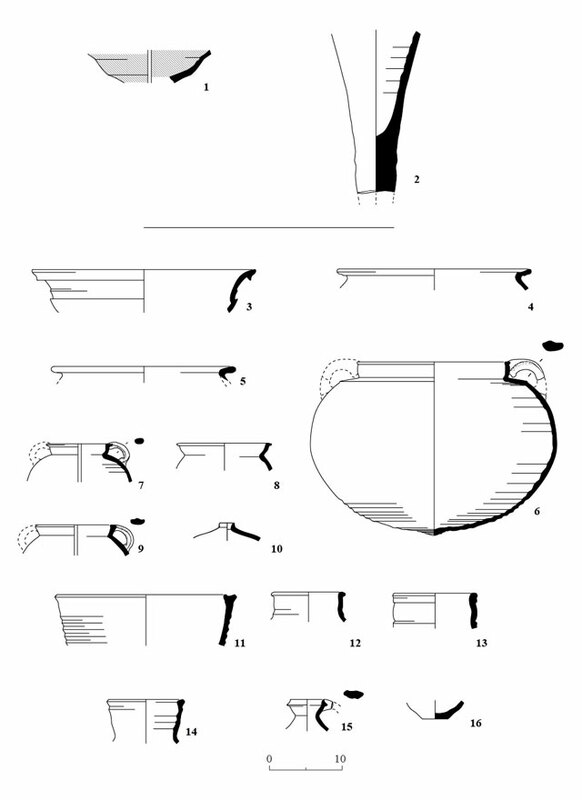 Square and rectangular ashlars, attesting to quality construction, and fragments of bowls from the Hellenistic period (see Fig. 10) were found on the bedrock (L110). Areas B and C (Fig. 5). 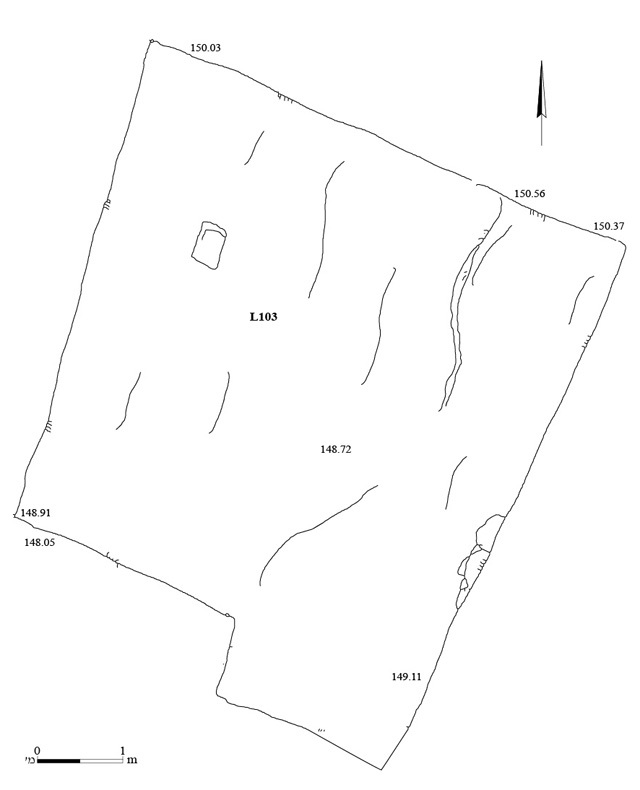 Remains of a building consisting of two parallel, eastern and western, walls (W108—length 3.2 m [Fig. 6]; W104—length 2.5 m [Fig. 7]), which survived to a height of two foundation courses, were founded on the bedrock. Several stones uncovered southeast of W104 (W112) were probably the remains of the southern wall of the building. No distinct floor was exposed, except for the remains of a habitation level which were found within a surface of crushed chalk. However, as previously noted, this area was clearly damaged by the tree roots. Pottery sherds belonging to cooking pots, jars and jugs from the Roman period (see Fig. 10) were discovered near these walls, west of the structure (L105). The cooking pots were found beside a group of rather smooth, concave stones, which may have been used for crushing and grinding. 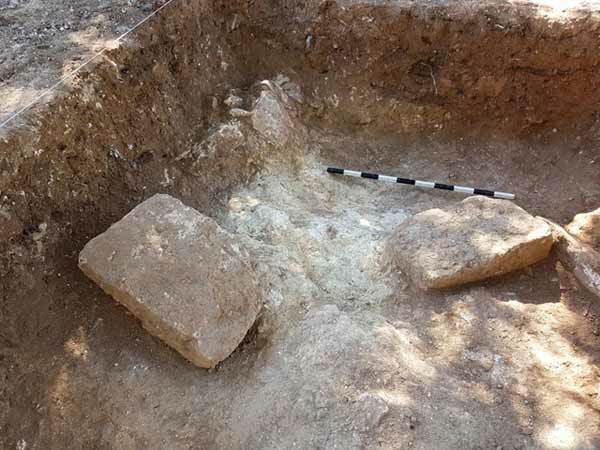 A large ashlar was found on the bedrock east of W108, in Area C. Collapsed stones to its north covered a row of large, well-dressed rectangular stones set along a northeast–southwest axis (W107; Fig. 8)—apparently the remains of a toppled wall. The ashlar was likely part of the wall, possibly a corner. Cooking pots from the Roman period were exposed within Stone Collapse 109 next to the wall. The elevation of the bedrock in this area was uneven, and it was unclear whether W107 was connected to Building 106. Area D (Fig. 9). Ashlars, identical in size to those in the collapse in Area A, were found on the bedrock, c. 6 m down the fill to the south of Area C. The finds include body fragments of jars from the early Byzantine period, fragments of jars and jugs from the third–fourth centuries CE (see Fig. 10) and roof tiles. Finds. Pottery vessels were found in topsoil, on the bedrock and on tops of walls and the crushed chalk floor. Only two sherds from the Hellenistic period were discovered: a burnished bowl (Fig. 10:1) with a carinated wall, which is characteristic of the second century BCE, and a Rhodian amphora base (Fig. 10:2), which was found on the surface and dates from late third century–early second century BCE. Most of the assemblage dates from the Roman period and consists predominantly of cooking vessels: a casserole (Fig. 10:3) that has a characteristic vertical wall with a slight carination at the top, which was dubbed ‘Zippori krater’, as it was found in large quantities at Zippori, but was apparently produced at a pottery workshop near Sikhin and dates from the mid-second century to the late third century CE; casseroles lacking a neck (Fig. 10:4, 5), also common at Zippori, dating from the mid-second century to the mid-fourth century CE; a complete cooking pot with a distinct carinated shoulder (Fig. 10:6), which was found on the crushed-chalk surface and dates from the second and beginning of the third centuries CE, although parallels were found in early fourth-century CE assemblages, like that from Jalame; a Kefar Hananya cooking pot (Form B4; Fig. 10:7) from the mid-first to the mid-second centuries CE; Kefar Hananya cooking pots (Form C4; Fig. 10:8, 9) that replace the previous type and date from the mid-second to the mid-fourth centuries CE; a lid (Fig. 10:10) for covering an open cooking pot that was in use throughout the Roman period; a cooking pot (Fig. 10:11) with a gutter rim, which was dated at Jalame to the mid-fourth century CE. Also found were jars (Fig. 10:12, 13) dating from the third century to the mid-fourth century CE; a jug (Fig. 10:14) from the end of the Roman period (fourth century CE); and juglets (Fig. 10:15, 16) that first appeared in the mid-second century CE and continued to be in use until the beginning of the fifth century CE. Although meager, the architectural remains exposed in the excavation are evidence of dwellings, some of which were built of hewn stones, and even ashlars, which were exposed in all of the excavation areas, some on the bedrock and some in situ. The remains date from the Middle and Late Roman periods (second–fourth centuries CE) but may have been used into the early Byzantine period. 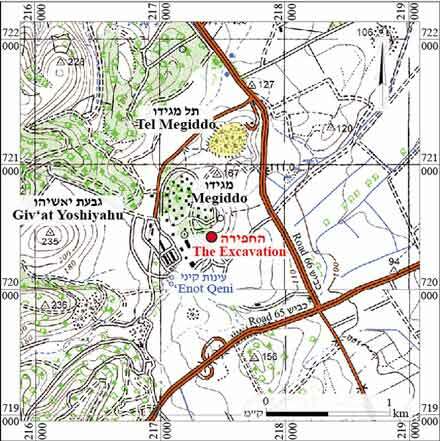 Due to the small size of the excavation, it is impossible to determine if the exposed building remains belonged to Kefar ‘Otnay, which was situated in this area, or to the Roman settlement—the camp of the Roman Legion or the adjacent city of Maximianopolis, which according to historical sources was located near Tel Megiddo. The few pottery vessels dating from the Hellenistic period are imported, attesting to trade relations with the Mediterranean Basin and corroborating the Schumacher’s finds which suggested that a Hellenistic settlement existed at the site. Gur Y. and Abu-ʽUqsa H. 2012. Megiddo. HA-ESI 124. Tepper Y. 2013a. Megiddo (Qibbuz). HA-ESI 125. Tepper Y. 2013a. Megiddo, Survey. HA-ESI 125. 4. Area A, ashlars exposed on the bedrock, looking east. 5. Areas B and C, plan. 6. Wall 108, looking east. 7. Wall 104, looking northeast. 8. The stone collapse of Wall 107, looking south.